Disclaimer: I requested a copy of this novel to review from Simon & Schuster. Kick Lannigan was abducted as a child before being miraculously found and returned home. Ten years later and Kick has immersed herself in every self-defence and weaponry practice, vowing to be stronger than ever. She's lived just fine on her own, but when Bishop - a mysterious man - comes to find her about the missing children's case, Kick is pulled back into a world she's tried hard to protect herself from. One Kick is an easy read due to the fast pacing and intense plot development. Immediately, the prologue creates an impact, drawing me into a world that I did not expect to encounter in this story. I know Kick get's abducted, but there's more to it and it was definitely an eye-opener. The story has moments of flashback to introduce important parts, but they were done short and succinct so it left an impression. This also meant I wasn't jolted out of the present time whilst reading. It was a solid plot, straight forward and memorable. 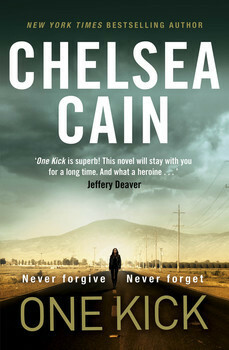 Chelsea Cain's writing was definitely a surprise, thrilling but also horrifying. There's quite a bit of gory moments, which I could stomach but still madee me cringe a bit. At first it was a little hard for me to get into the story, but then the novel started flowing and I quickly got hooked. It's pushed as a thriller, but does become quite emotional at some points. Cain does a great job in greying out the area between good and bad, especially in people, which I liked. I grew to like Kick, stubborn and hot-headed, but deeply scarred so you can't help but hold some sympathy towards her - even if she never asks for it. I admire her strength but can also relate to the vulnerability that is hidden underneath the front that she puts up. Her interactions with Bishop were amusing but also interesting. I'm not sure what direction they'll end up in, but it's definitely a relationship where they're both wary of each other yet, can still be open enough to develop a bond. As for Bishop, I'm intrigued about his role, but as a character he's still little too mysterious to really determine a conclusive judgement. One Kick is the first in a series, but I found that it made for a good introduction to the characters and the setting. I'm not sure what the next book will touch upon, although it is hinted at the end. I do have a few questions but I'm hoping they'll be answered later on. The novel didn't end without some hiccups - I am confused at some parts as well - but they're not overly noticeable to detract from the entire story. One thing I know for sure, One Kick has definitely pulled my interest into Cain's other works and the continuation of this series. One Kick will be released on the 19th of August, 2014. I just read this! I found it really easy to be drawn into the story, too, I managed to read it in a day. Kick's interactions with Mel I found were particularly grey, especially regarding her feelings and memories from the time. Really interesting read, I'm kinda interested in where it will go next! Yeah, it was easy to read! Mm those interactions were the most interesting I reckon, because you could see how conflicted she was but at the same time he wasn't exactly an angel. I know I'm curious where it will go!